Showstopping Piebald, The Magpie, cleared up in the prestigious Coloured Horse and Pony of the Year Championship Sponsored by CHAPS (UK), taking the overall honours on the final afternoon of Horse of the Year Show (HOYS) to end a very successful season. While Adam has experienced wins at HOYS on the ground with ponies he has produced, he has never ridden to victory himself. He certainly enjoyed his time in the spotlight today. Homebred Skewbald Rodney Trotter III ended his season on a high standing Reserve Champion after taking the win in the Native/Cob/Traditional Pony section. The nine-year-old is owned, and was bred by, Lynn Scott and ridden and produced by daughter Emma. 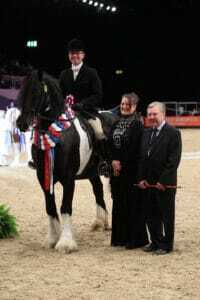 Eight-year-old Skewbald gelding Bart took the Non-Native Horse section, owned and ridden by Vicky Smith. Vicky was still buzzing from her HOYS victory yesterday, where another of her horses Bling Cobsby stood Colosso Family Cob of the Year Reserve Champion, and she had three rides in the Coloureds today to keep her busy. Vicky rode Bart at HOYS last year where they finished fifth and her partner Alan Marnie bought him earlier this year from Gillian Hickford. They’ve had a great season winning at The Showing Register Show, BSPA Northern and the North of England. The first class of the Championship was the Non-Native Pony section, which saw Hannah Horton pilot Rosemary Obbard’s Skewbald mare Champlers Allsorts to the top spot.